Ganesh snagging grinder is designed rigidly and precisely. Main shaft is rotated in double row ball bearings. The shaft can take both heavy radial and axial loads. The motor is mounted at bottom. Rigid guards are provided on two sides of wheels. Bearings on main shaft are made dust proof with seals. • Capacity : 12”, 16”, 18”, 24”. 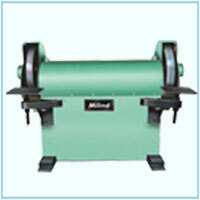 Ganesh swing frame grinder is designed to withstand heavy loads. The bearing housing is clamped to the heavy tube and guard. The main body is constructed from heavy seamless tube. The spindle is dynamically balanced. 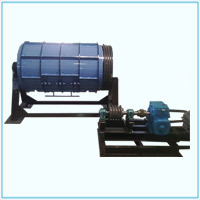 The design is precisely made to make the machine vibration free. Belt tensioning is provided. Ganesh vibrating knockout machine is rigid in construction to sustain and to transmit the vibration to the moulding box. 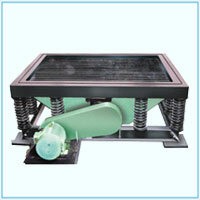 Vibration is by electric motor through belt drive or by VIBROMETER. 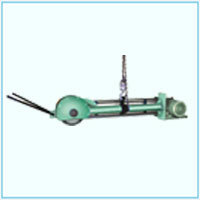 Vibration is controlled by unbalanced weights provided on each side of spindle. The separated sand from the moulding box effectively, falls on the grid and flows to the bottom conveyor of sand plant. It stops the breakage of mould box and increases life. • Rigid construction to sustain & transmit the vibration to moulding box. • Stops the breakage of mould box & increase life. • Capacity - 500 kg. to 5000 kg.